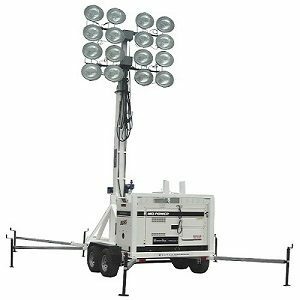 PORTABLE 60-FOOT ULTIMATE PORTABLE LED STADIUM LIGHT TOWERS SIXTEEN FLOODLIGHTS are produced with either LED or Metal Halide high powered floodlights. At 60′ this tower will illuminate over 60+ acres and project light 1000′. The Metal Halide package with sixteen 1000w floodlights will take the place of 10 commercial 30′ light towers on a large projects. 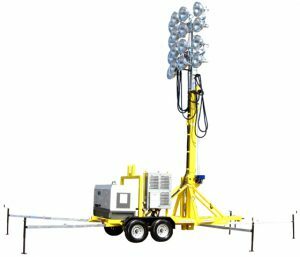 Huge cost saving when evaluating fuel cost saving, labor to turn tower off and on each day, cost savings to fuel 10 towers compared to only one Stadium Towers. Plus the savings in down time to service monthly 10 towers again to only one 60′ Stadium Light Tower. Boss offers both LED and Metal Halide Floodlighting. Boss will always recommend to clients to use the Metal Halide product. Metal Halide has 4 times the candle-power of LED. Plus the replacement cost of a LED fixture will be 4 times that of a Metal Halide. Selling Opportunist will tell you LED will last longer because it will burn up to 25,000 hours. Job-set construction managers and service technicians will tell you that LED fixtures break as often as Metal Halide. 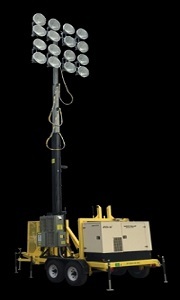 LED floodlights never have the opportunity to last 25,000 hours in a portable applications. Real construction pros are aware of this fact.